Luang Prabang is the ancient capital of the Luang Prabang Province in Laos. Home to more than 55,000 residents, it is a destination renowned for offering travellers incredible history and scenic natural beauty. 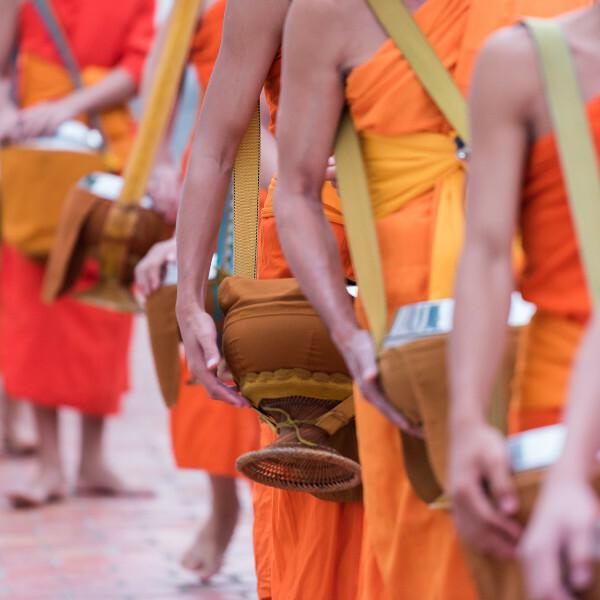 Luang Prabang presents you with the opportunity to explore numerous Buddhist temples. Leading attractions include Kuang Si Falls, the Old Quarter and Wat Xieng Thong. 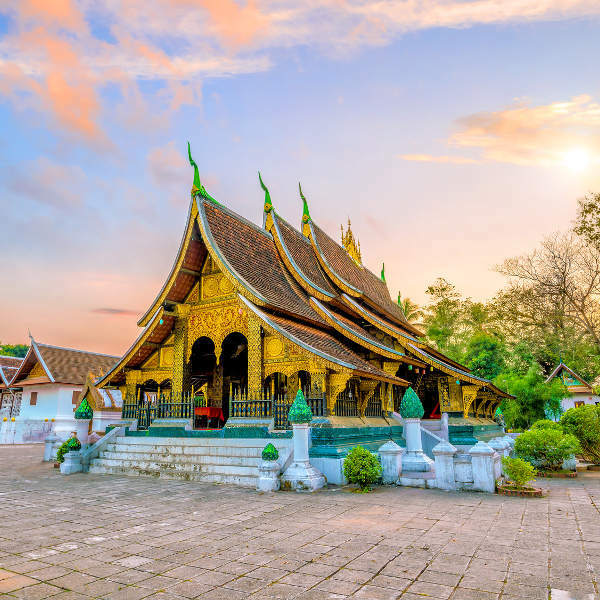 Prepare to discover this beautiful city in northern Laos, because cheap flights to Luang Prabang are now available for a limited time! Luang Prabang is home to Luang Prabang International Airport (LPQ), situated on a 15-minute drive from Luang Prabang’s city centre. The numerous temples and architectural sites of Luang Prabang are a testament to the city’s wealth of history. Well-visited locations include Wat Xieng Thong (Gold City Temple), Wat Sensoukaram and the charming scene of the Old Quarter. 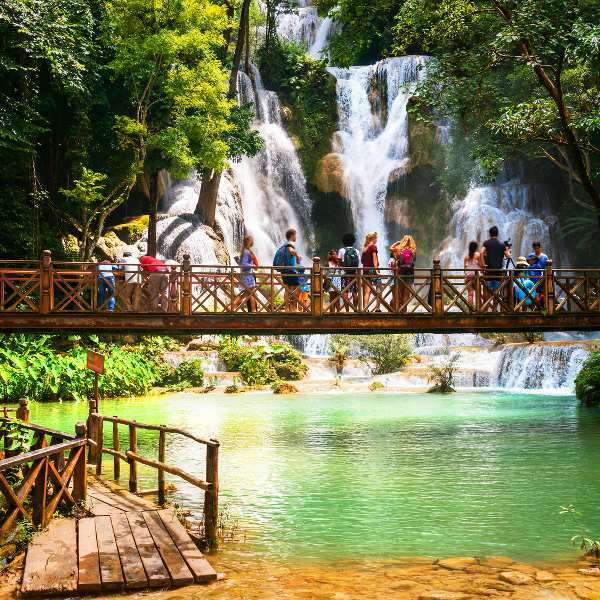 Luang Prabang boasts some spectacular natural scenes and wildlife attractions. You might even find yourself getting lost as you explore locations such as Elephant Village Sanctuary & Resort, Kuang Si Falls Butterfly Park and Nahm Dong Park. Despite gaining a reputation as a tourist destination, Luang Prabang has managed to retain its rustic charm. Make sure to observe the daily life of the locals, especially the large monk community, during their procession through the streets at sunrise. For the ideal opportunity to discover Luang Prabang, visit between the rainy season of May to October. While this is the wettest time of the year, there are still plenty of periods with wonderful sunshine. The cooler temperatures bring fewer tourists than in the dry season (November to April), meaning you can get to know this ancient city at your own pace. Between September and October, you can enjoy the exciting event of dragon boat races on the Nam Khan River, which brings in many competitors from the surrounding villages. The beautiful and historic city of Luang Prabang sits in a valley at the meeting place of the Mekong and Nam Khan Rivers. The royal capital of Laos until 1975, it is known for its many Buddhist temples and gorgeous natural scenery. Explore this UNESCO World Heritage Site and discover a diverse collection of architecture, such as buildings left behind by French colonials and traditional Laotian wooden houses. Get ready to immerse yourself in the history of this city, which goes back over 1000 years! Popular historic locations include the temple of Wat Xieng Thong (which dates back to the 16th century) and Wat Mai (the former residence of the head of Laotian Buddhism). Other historic attractions include the Haw Kham Royal Palace Museum and the numerous small wats (temples) on the main street. When you’re done exploring the large selection of historic sites around Luang Prabang, head to the centre of this destination, where you will find the charming Mount Phousi. From this position, you can enjoy amazing views over the city as well as the river systems. For some of the natural attractions around Luang Prabang, take a tour through the scenic landscapes surrounding the city. Discover breath-taking waterfalls or go on an adventure exploring mountain trails on foot or on bicycles. There’s also the exhilarating activity of kayaking, or the more relaxing pastime of indulging in river cruises. Major picturesque locations include Kuang Si Falls, Tat Sae Waterfalls, and Pak Ou Caves. Compare several airlines and book cheap flights to Luang Prabang with Travelstart! It is advisable to take medication for malaria and dengue fever. Make sure to get immunisations against hepatitis A and B due to possible contact with contaminated food and water. If you rent a motorbike, make sure to bring your own lock and avoid leaving your passport as a deposit. If you are interested in the Monk Alms Ceremony, it’s best to watch quietly from the side of the road, especially if you are not Buddhist. If you wish to give money to the monks, check with your hotel, that can organise it for you. Beware of scam artists who may try to take advantage of the situation to trick you into parting with your money. These individuals are usually women and are not Buddhist. Vendors in the night market may try to change the price of goods once they have received your money. Be sure to emphasise the price you want to pay and pay with exact change. When using the tuk-tuks, once you have agreed to a price with the driver, make sure to pay the exact change and that other people saw you giving a bank note. Drivers may try to give you less change.